A few weeks ago, I was host Dana Hilmer’s guest on LifestyleMom Radio Cafe, an Internet radio show aired through LA Talk Radio. In my 35-minute segment, we chatted about Cooking for Bikini Season and other tips how to make delicious foods while slimming down your waistline. If you’d like to create and live a healthier, simpler and more passionate life while raising a family then this is the show for you! 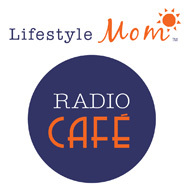 The LifestyleMom Radio Cafe is an internet radio talk show for women who crave information, inspiration and lively girlfriend-to-girlfriend conversation about the topics that matter to them most. Host Dana Hilmer serves up a delicious blend of entertaining and thought-provoking banter with some of today’s most inspiring women. Pull up a chair, pour yourself a fresh cup and enjoy!